In the local Dayak language, Palangkaraya means ‘holy container’. 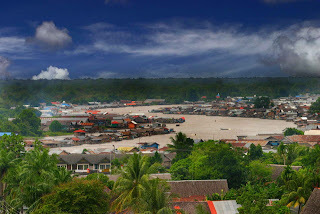 Palang¬karaya can easily be reached from Jakarta, Banjarmasin, Samarinda, Balikpapan and other points on the island by air. The town has become the center of government, trade and education of the province. The Regional Museum of Palangkaraya contains a collection of historical and cultural interest from all over Central Kalimantan.